Now is the time to enjoy sweet cherries. Already this summer, you may have prepared cherry desserts ranging from pies to clafoutis. Another way to incorporate this fruit into your summer repertoire is a cherry salsa to enhance your main course. I used the quantities below for an accompaniment to a grilled pork loin dinner for two (with some left over). 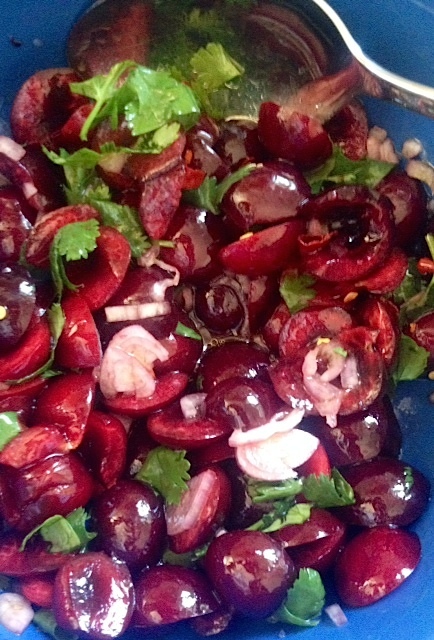 Mix the cherries, shallot, cilantro, chili and olive oil in a bowl. Taste before adding and mixing in your desired amount of sea salt and a dash of curry. Permit the flavors to combine by placing the bowl of salsa in the refrigerator for about one hour before serving. This sweet yet spicy salsa makes for a refreshing addition to grilled pork and would also pair well with a grilled fish. Make the most of cherries during their peak this season! This entry was posted in Uncategorized and tagged Cherry, Chili, Cilantro, Cooking, Curry, Food, Fruit, Pork, Recipe, Salsa, Shallot, Spicy, Sweet. Bookmark the permalink.